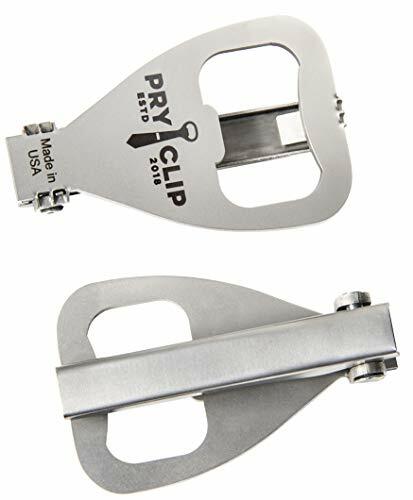 The PRYCLIP is a unique product that will not only serve its purpose as a tie clip, but bring the added perk of a useful and durable bottle opener. Why wear a normal tie clip when you can wear the PRYCLIP! * QUALITY - The PRYCLIP is made 100% of high quality stainless steel material. Designed to last for years and limitless bottle openings. * DESIGN - This original design has been carefully thought out to ensure performance, appearance and endurance. The bottle opener was designed to reduce size and weight without sacrificing its effortless bottle opener function. The tie clip is elegantly finished to stand out from the crowd and made to fit standard ties. * TIE GRIP - Tie grip is an extremely important factor when selecting your tie clip. The PRYCLIP has enough strength to hold your tie in place and not slide, but does not grip to the point of damaging your fabrics. * GIFT PACKAGE - Your order will come with a high quality muslin bag stamped with the PRYCLIP logo. This can be used as gift wrapping or a way of presenting to your groomsmen. * OCCASIONS - Perfect for groomsmen, birthdays, Father's Day, Christmas, business gifts and many others. TIE CLIP - The PRYCLIP can be worn on your tie just like other tie clips. You won't feel the bottle opener and others won't know until you pull it off and show them what their tie clips are missing. BOTTLE OPENER - Use the built-in bottle opener to easily remove caps. VERSATILE - The PRYCLIP can be worn in a variety of ways. You can wear this accessory on your hat, on your pants pocket and many other ways. GIFT - This product is perfect for groomsmen gifts, birthday presents, Christmas, etc. PURPOSE - Ultimate accessory that secures your tie to your dress shirt. The masculine design makes for a bold tie clip appearance and always useful bottle opener tool. The brushed steel finish (matte) will stand out as a unique tie clip, bottle opener & accessory. If you have any questions about this product by PRYCLIP, contact us by completing and submitting the form below. If you are looking for a specif part number, please include it with your message.